Cut-to-Length aluminum extrusions ship next day, even with anodizing SAF – Southern Aluminum Finishing Co, Inc.
SAF can deliver quality pre-cut Cut-to-Length aluminum extrusions ready for installation or further fabrication. 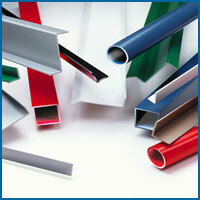 All of our standard inventory of in-stock extrusions ship out the NEXT DAY, EVEN IF THEY NEED TO BE ANODIZED! We have NO MINIMUM order requirements for items cut from mill standard stock. This service is ideal for contractors, hobbyists, educational institutions, laboratories, research, and do-it-yourselfers. Tell us what you want and usually the same day we can cut, pack, and ship your cut-to-length extrusions via UPS. To expedite we suggest you have the order charged to your VISA/Mastercard, which will be less costly to you than C.O.D. Call one of our inside sales representatives at (800) 241-7429. They will gladly help with your product description and in writing up your order. Please be aware that our personnel are not authorized to recommend a particular product for any given application. The choice of material is the responsibility of the customer and Southern Aluminum Finishing bears no responsibility for the performance of the product or its suitability for any particular application. Should you need technical data, our sales representatives will be pleased to fax you photocopies of the appropriate pages from “Aluminum Standards and Data”, which is published by the Aluminum Association, 900 19th Street, N.W., Washington, D.C. 20006.